I'm southern born and bred. Four generations of my family worked in the cotton mills along the Chattahoochee River of Columbus, Georgia, the last southern city of the Civil War to be attacked and burned on Easter Sunday, April 16, 1865. The Union soldiers received the memo eight days too late that Robert E. Lee had surrendered. We are home to the National Civil War Naval Museum, and in our historic Linwood cemetery rests Columbus' own Civil War Brigadier General Henry L. Benning who was known as "The Rock" after fighting in bloody battles like Chickamauga. His legacy remains in the name of the greatest and largest infantry center in the world. Fort Benning, Georgia was established as Camp Benning in 1918, receiving permanent status during World War II and now covering 182,000 acres for training the world's greatest infantrymen who now fight for our nation and the world against terrorism. Fort Benning is also the annual November protest area for the SOA watch. The School of Americas now called WHINSEC (Western Hemisphere for Security Cooperation) was "established when the US Congress passed--and President Clinton signed--the Defense Authorization Act for FY01 to provide professional education and training for civilian, military and law enforcement students from nations throughout the Western Hemisphere." The protests began after the 1989 murder of a Jesuit priest and lay women in El Salvador by some from Latin America who had attended the SOA and returned to their country to commit crimes. Priests and nuns say their actions are to memorialize the slain through protesting Fort Benning's School of Americas. Over the years protesters have dwindled down to the hundreds of students bused in from Jesuit related high schools and colleges around the country. This year, November 17, they came again to the Ignation Solidarity Network's Ignatian Family Teach-In to reflect on their commitment to living "a faith that does justice", and to call for an end to unjust institutions, including the SOA/WHINSEC. My thought is murderers also come out of colleges. Should we begin protesting schools of higher education? The teach-in was held at my town's historic Civil War Iron Works building, now the Trade and Convention Center. Did I mention that in our Civil War we had wounded and dead of an estimated 1.1 million? This convinces me that these kids associated with Boston College and Weston Jesuit School of Theology, and described to me "showing an abysmal lack of knowledge" are definitely here for the free trip and easy college credit, or surely they would request not to meet in a building that provided so much ammunition for America's Civil War. However, Fort Benning and my southern counterparts are courteous to these students with arm bands that read, "Close SOA," sweatshirts with "Close Guantanamo" and some with signs that read, "Stop the unjust war in Iraq." The registered students, at least 750 this year, as always, were taken on busses by Fort Benning authority to tour WHINSEC (SOA) and hear an educational lecture. 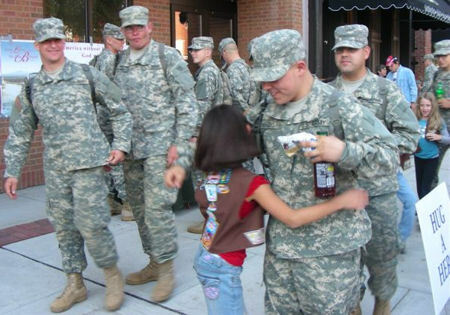 Afterwards they had the opportunity to return and stroll along our beautiful historic Uptown Columbus Broadway where the annual God Bless Fort Benning event was in full swing to honor our Fort Benning soldiers and families. 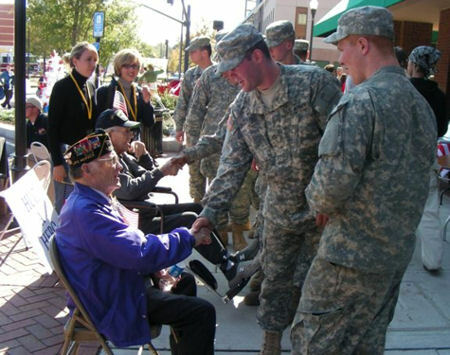 A day full of sun and brisk fall temperatures, I was so proud of students from our Columbus State University who came to thank our soldiers and provide activities from a kissing booth (on the side of the face to karaoke for the soldiers. On my corner of Broadway called 'Hug a Hero' I spent all day with friends from Veteran's chapters, Blue Star Moms and Wives, Gold Star Wives, Girl Scouts and Brownies, Operation Response and Operation Home Front giving out as many hugs, hand shakes, and thank yous as possible to the young men who will graduate from basic in the next few weeks and soon head to Iraq or Afghanistan. Troops shaking hands with veterans These young men in turn shook hands with and thanked heroes who fought in WWII and Korea. Verizon Wireless and T-Mobile set up tent areas and provided hundreds of free phones for the troopsto call home. Claudia Pemberton who drove ten hours from West Virginia provided free copies of her book Love Leaves No One Behind to the troops. "I don't have the heart to sell my book to these heroes," she told me. Commanding General and Mrs. Walt Wodjakowski, Dr. Laura, Dr. and Mrs. Tidwell, founders of GBFB, soldiers, and supporters connected to the event's success. Fort Benning provided Humvess and Stryker vehicles for children and adults to explore. Food was abundant from vendors and restaurants located on Broadway where the Kress and H.L. Green signs can still be seen on the face of century old brick buildings. The only faces not sharing our broad smiles on Saturday were those who appeared to be part of the WHINSEC protest. They looked none of us in the eye as they strolled past in small groups, too young and uninformed about their nation's history and military to truly understand why they were there, except for school credit and a free trip; and too misinformed by today's media to grasp the depths about the war on terror and successes in Iraq. Young people that I would have loved to have sat down and spoken with but my husband thought it best I didn't. Young people that may one day see themselves as speaker David Horowitz. I once heard him say that as he grew older he realized how stupid he was as a Vietnam era college protestor. Maybe one day students and individuals like those who wear arm bands of protest today will have an epiphany before it's too late to understand that freedom is not free. Maybe one day they will help fight to retain it. Or maybe not. 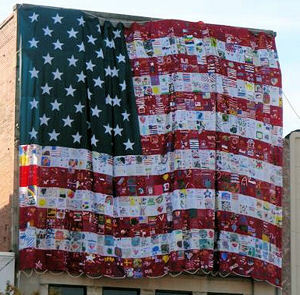 But for now, I'm proud of my hometown where my husband was also born, its history that I strive to learn from, its support of the greatest infantry men and women in the world, and our new GBFB visitation center where soldiers will be provided support by their community and have access to computer stations and telephones. God bless Columbus, God Bless Fort Benning and its sponsors, God bless our troops and families, and God bless America. Deborah Tainsh, Gold Star Mother of Sgt Patrick Tainsh KIA Baghdad, Iraq, 2/11/04, is the author of Heart of a Hawk - One family's sacrifice and journey toward healing, recipient of the Military Writers Society of America's Spirit of Freedom award. Deborah is also a supporter of America's military and their families. She is a national speaker, writer, and peer mentor for TAPS (Tragedy Assistance Program for Survivors and Good Grief Camp for Young Survivors) located in Washington, D.C. She and her husband, USMC Sgt. Major (Ret) David Tainsh live in Harris County, Georgia, near Columbus and their son, Phillip.